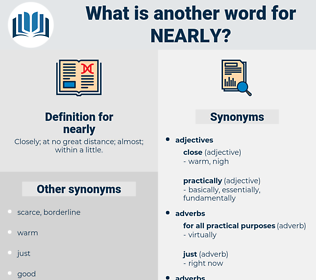 What is another word for nearly? Closely; at no great distance; almost; within a little. 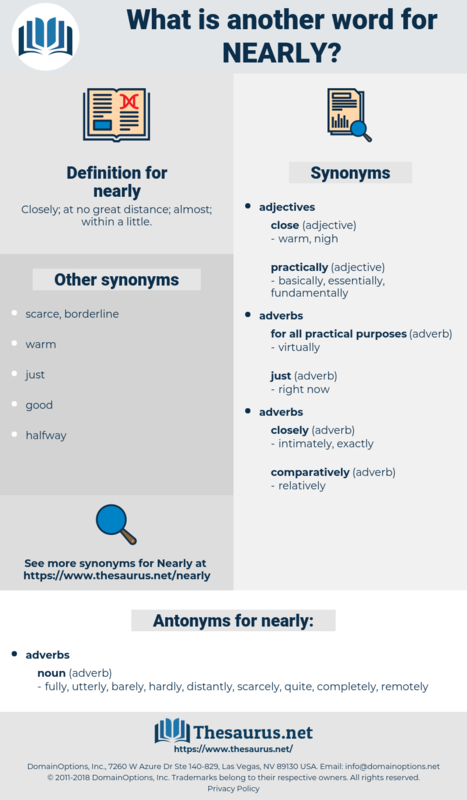 virtually, practically, roughly, about, barely, closely, hardly, scarcely, essentially, substantially, largely, nearby, some, carefully, pretty, closer, fairly, soon, basically, attentively, recently, mostly, quite, nigh, relatively, almost, literally, rarely, shortly, intimately, narrowly, just. fully, utterly, barely, hardly, distantly, scarcely, quite, completely, remotely. Now, sir, you did your best to save my life last night, and you killed that fellow who did for me, and you pretty nearly got killed yourself.
" You very nearly did miss us," said the Doctor. narrow wale, nonmoral, narial, Neroli Oil, narwhal, NRL, narwal, narwhale, neural, narrowly, numeral.